Have you ever been truly frustrated and just not had the words to express your self? Welcome to the preschool world of your toddler, There is so much to say and do but their ability to verbalize has just not caught up with all they are experiencing. At Galaxy Ranch School we help day care become more fun by easing these frustrations through the use of sign language. Children learn new words each month and past lessons become part of their every day signing vocabulary. Our toddlers are so busy exploring the world – so we give them plenty of opportunities for exploration of all types. Filling a child’s day with words is crucial as children this age are absorbing language at an incredible rate. Through this wonderful curriculum by Pam Schiller we give toddlers and twos lots of words to help explore their world – over and under, sweet and sour, hot and cold, night and day. We strive to activate preschoolers’ senses, giving our children plenty of opportunities to taste, see, hear, touch and smell the world around them. We learn best when we are active and interested in the subject at hand; children are no different. The McGraw Hill/DLM curriculum is theme-based and integrates all subjects – from science to social studies to literature and music to have Preschoolers and Pre-kindergarten students exploring all angles of the subject at hand. When learning about pets, our prekindergarten students will learn social studies through bringing in pictures of their pets for a class collage and discussing what animals make appropriate pets. They’ll recount the story of Goldilocks and the Three Bears, using flannel board characters to learn one-to-one correspondence by matching the bears to what things are just right for each bear. Children will talk about the differences between cats and dogs, snacks and lizards, fish and turtles. They’ll giggle through tongue twisters like “Three Terrifying Tigers,” and move to the rhythms of “Bingo” and “Bunny Hop”. Science will include questions on the characteristics of living things and the different characteristics of plants and animals. Flannel board stories like My Sick Little Donkey and books like Can I Keep Him? By Steven Kellogg get preschoolers excited to learn about how their pets came into their lives. Students will get the opportunity to tell their own stories about their pets or why they may not have one as they work with classmates on collaborative stories and journal writing. You will find no worksheets at Galaxy Ranch Private School. What you will find is engagement – Preschoolers, Prekindergarten and Kindergarten students taking a hands-on approach to solving hands on problems. Children learn best when starting with the abstract and working toward the concrete. Schiller and Peterson’s Count On Math curriculum helps teachers introduce algebraic concepts such as spatial relationships, hands-on addition and subtraction work, one-to-one correspondence. Students learn geometrical concepts such as shapes and patterning, through hands on use of everyday objects, from blocks to leaves. Mr. B has beautiful baby blue buttons. Children love tongue twisters and silly rhymes, and The Letter People help our students learn letters and sounds through stories, songs and books. Making the connection between letters and the sounds they make is the building block for reading. Everyday phonics instruction improves kindergarten students’ reading comprehension, spelling and word recognition. 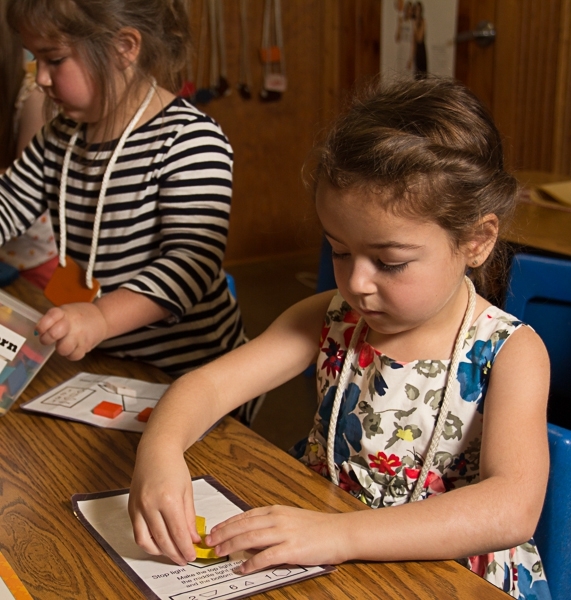 Use of the Modern Curriculum Press Phonics workbook helps Galaxy Ranch students organize their learning and increase their confidence with the written word. As Shakespeare said, “Life is a Stage” and Reader’s Theater gives kindergarten students a part in that play. This program also allows kindergarteners to improve their sight word recognition, confidence and reading comprehension. Studies show children learning to read work so hard at sounding out words, by the time they’ve finished reading a sentence, they have no idea what they have read. With Reader’s Theater, students spend the week learning to read their script with feeling and expression. Along the way, they learn the importance of tracking and teamwork. Children conclude the week by performing their script for groups around the school, building self-confidence and a love for reading. The University of Chicago School Mathematics Project’s innovative curriculum eliminates helps answer that timeworn question, “Why do I have to learn math? I’ll never use it in real life.” We all use math, every day, in one form or another. This interactive curriculum teaches kindergarteners why math is so important and how to use it everyday. Students also learn to create their own words problems that help enhance their creativity and higher-order thinking. Before the age of 6, children have a unique capacity for picking up sounds and absorbing new grammar. Therefore, we help them get started on one of the most spoken languages in the world – Spanish. Our students in Preschool 2 and older work with our Spanish teacher to learn this language and expand their world. Classroom teachers work with the children throughout week, adding emphasis to these fun new words and concepts. No floaties. No water wings. At Galaxy Ranch Private School we feel swimming is such an essential life-long skill we include it in our curriculum for all students who are 3-years-old and are competently potty trained. Learning to swim will not only keep your child safe, it will give them a skill that will allow them to engage in countless recreational opportunities throughout their lifetime. Swimming is also great exercise.